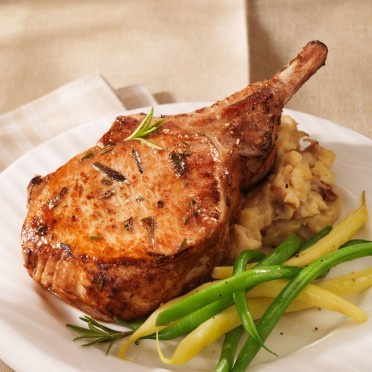 ALL NATURAL DUROC™ Premium Pork With a Difference You Can See & Taste! 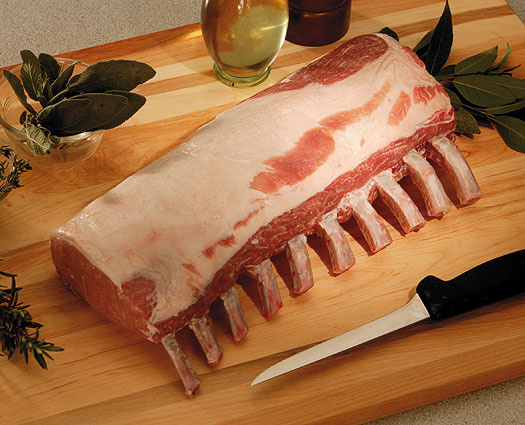 Duroc™ promises an “All Natural,” mouthwatering, rich flavored pork, with superior tenderness and natural juiciness. Bright reddish pink in color, Duroc contains a higher percentage of intramuscular fat (marbling) and a higher pH. These unique attributes translate into a more tender, juicy and flavorful dining experience. This selection of pork enables you to enjoy fresh pork in its natural flavor and juice, without injecting or pumping. Quality Starts With the Right Breed — Duroc, the "Black Angus" of Pork! The Black Angus breed of cattle is well known for its superior quality. This same phenomenon is also true of Duroc pork. The Duroc breed excels for meat quality and eating characteristics documented in tests performed by the National Pork Producers. Although pork is known as “the other white meat,” in its raw form dark pink to dark reddish pink is the most desirable color to look for when buying pork. This has caused some confusion for the consumer, because all pork turns white after being cooked. Darker, reddish raw pork will typically be juicier, more tender, and have a higher pH than lighter colored raw pork. These characteristics are essential for superior eating quality. Premium quality Duroc pork is the result of a carefully managed pork breeding program. Duroc hogs are bred, born and raised on small farms where family members are involved in the day-to-day management of their stock. The breeding program is the result of over 55 years of combining the very best purebred lines of the Duroc breed. Duroc Family Farms™ have also conducted extensive research and development to create a proprietary Duroc feeding program. This feeding program optimizes both the pig’s performance and its meat quality. This, coupled with raising the pigs in comfortable, environmentally stable facilities, reduces stresses that adversely affect muscle quality. Premium Quality Duroc pork now available "Fresh" or Frozen! That's right, not only can you order Duroc Pork frozen we can deliver "Fresh!" We can customize your cuts and deliver them to you Fresh! Every item is vacuum sealed and individually wrapped. If you prefer "fresh," please call us direct as the price is subject to change.